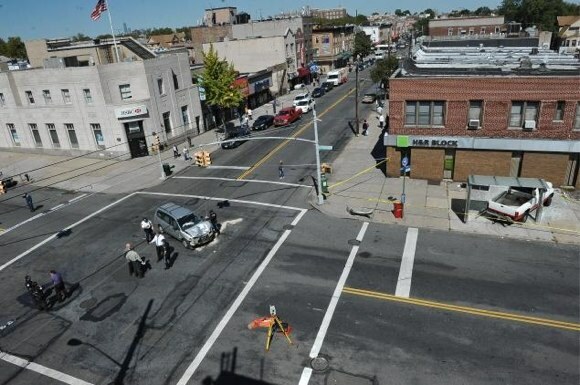 Two drivers, one of them unlicensed, collided at an intersection in Dyker Heights late Tuesday morning with sufficient force to send a pickup truck through a bus shelter where several people were waiting for the B4. James McCloskey, 71, was killed. NYPD says no one did anything wrong. The crash occurred between 11:30 and 11:40 a.m., according to reports, when the driver of a minivan and the driver of the truck slammed into each other at Bay Ridge Parkway/75th Street and 13th Avenue. Others managed to get out of the way, but McCloskey, who was sitting on the bench, couldn’t escape in time. The truck ripped the bench from the sidewalk and smashed through the shelter glass. McCloskey died Tuesday afternoon at Lutheran Hospital. He was at least the fifth senior killed by a New York City motorist in the last month, and at least the 25th pedestrian or cyclist age 65 or older to die in traffic in 2013, according to crash data compiled by Streetsblog. WCBS and the Daily News reported that the driver of the minivan was ticketed for driving with an expired license. The speed limit at this intersection is no more than 30 miles per hour. Both vehicles were damaged extensively, and photos show that the minivan’s airbags deployed. Assuming traffic signals were functioning properly — there is so far nothing to indicate otherwise — and since one of the drivers was allegedly breaking the law just by being behind the wheel, it is difficult to imagine a scenario where neither driver did anything to precipitate this deadly collision. Unless you investigate crashes for NYPD. The investigation is ongoing, according to police, but said the driver of the truck made no attempt to flee the scene, and there was as yet no evidence of wrongdoing. As of last night, police were telling the media there was “no criminality,” which is NYPD-speak for a crash in which the driver was not intoxicated and remained at the scene. In nearly all cases it also means no charges will be filed. According to attorney Steve Vaccaro, who represents the families of pedestrians and cyclists killed by NYC motorists, “investigation ongoing” can sometimes mean NYPD is waiting on toxicology reports on the bodies of the victims. This fatal crash occurred in the 68th Precinct, where at least two other pedestrians have been killed by drivers this year, and where officers have issued 256 speeding tickets as of August, and cited 63 drivers for speeding in 2012. To voice your concerns about neighborhood traffic safety directly to Captain Richard G. DiBlasio, the commanding officer, go to the next precinct community council meeting. The 68th Precinct council meetings happen at 7 p.m. on the third Tuesday of the month at the precinct, 333 65th Street. Call 718-439-4229 for information. The City Council district where James McCloskey was killed, in addition to at least two other pedestrians this year, is represented by Vincent Gentile. To encourage Gentile to take action to improve street safety in his district and citywide, contact him at 718-748-5200 or vgentile@council.nyc.gov. No evidence of serving and protecting. No evidence of justice. No evidence of safety. No evidence of taxpayers getting anything for tens of thousands on the city payroll. Steve V., Streetsblog, anyone else: I’d love to see a good estimate of how many or what percentage of cases about which “investigation is ongoing” gets uttered actually end up involving charges or violations *after* that “it’s ongoing” statement is given to the media. What do the vehicle black boxes say? People driving vehicles on highly subsidized public roads have NO reasonable expectation of privacy. So aside from the unlicensed driving, how exactly can two cars traveling in perpendicular directions collide in the middle of an intersection without anyone breaking the law? What are the issues with this, exactly? Is it that NYPD doesn’t want to allege criminality because the officers don’t want to spend their valuable time on these cases? That the DA won’t pursue charges because the courts will inevitably say there’s not enough evidence to prove it? That there aren’t criminal penalties for illegal driving? All of the above? OK, people — “Escape from New York” was/is a movie title; NOW, it’s an EXHORTATION — GET THE HELL OUT, NOW, WHILE YOU STILL CAN! THE POD PEOPLE HAVE TAKEN OVER! I thought that the point of needed a license to drive is that it’s a crime to drive without one. Why would you need toxicology on a victim who was hit while sitting on a bench? Are we next going to hear that earphones, texting or other “distractions” contributed to his being hit? And why aren’t motorists who crash not subject to “toxicology”?